I don't think it is any secret now that my eldest is a hige fan of the Dork Diaries books, she was actually featured in one of their You Tube videos, her claim to fame. 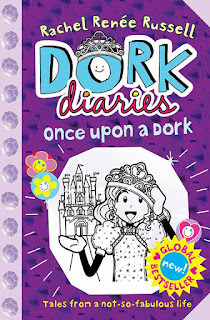 We've reviewed other Dork Diaries books in the past including Tv Star and the latest one we are reviewing is Once Upon a Dork…. Mirror Mirror on the wall, who is the dorkiest princess of them all? Cinderella? Sleeping Beauty? Nikki Maxwell? After a bump on the head, Nikki has a wild dream in which she, her BFFs Chloe and Zoey, her crush Brandon, and mean girl Mackenzie are all part of well known fairy tales… with a very special dorky twist! Will Nikki find her happily ever after, or will it be an epic fairy fail for this dorkella? Dork Diaries : Once Upon a Dork was a delightful read. This book was a twist on many classic fairytales which happened to include Nikki Maxwell. My favourite characters were the munchkins, they were laugh out loud funny! The picture of them drawing on Mackenzie (the Wicked Witch of the West), and she totally deserved it! My favourite moment was when Nikki finds out the Good Witch of the North is Brianna, I was actually shocked that she was responsible enough, not sure why her parents would let her? One thing I would like to know more about in this book, what characters are the teachers? What about Thumbelina, The Gingerbread Man or Robin Hood? I have to say this book really got me thinking. I recommend this to those who like fairy tales with a little added twist, especially dorky twists! My final verdict a true fairytale. Do you have a Dork fan in your house? You can buy a copy of your own from amazon, what do you think should happen to Nikki in the next book?? Disclaimer I was sent this book FOC for reviewing purposes however all thoughts and opinions are my own. Hehehe, looks like we had the same book! Nice to read someone elses review too! These books are so popular with the kids I know. I've not read them, my Monkey is still too young. They sound like fun though!